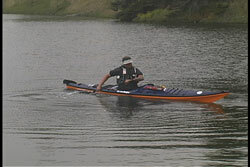 A sweep stroke is one that is primarily used for turning a kayak. 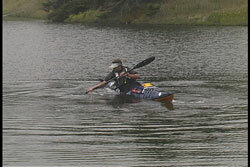 If we do a forward sweep stroke on the right side of the kayak, the kayak will turn left as long as there are no other forces affecting the kayak. If the stroke is done with the blade on knife edge you will get the turning power, but not support. 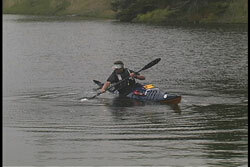 Your balance point needs to be over the kayak or you will capsize. Since a kayak will usually turn more easily, if you edge the kayak and lean your body, a variation of the sweep stroke must be done in order to get the support you need so you do not capsize while edging and leaning. As you will see, the supportive sweep stroke uses the blade on an angle rather than on knife edge. You end up getting support and turning power. 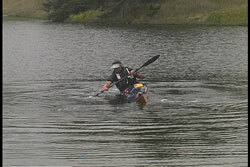 Even though the turning power from the blade may be less, the net result on the turn is greater because your kayak is on edge which allows an easier turn. This is a good time to review USK's article, "Sculling" so you understand when I say, "climbing angle of the blade." Begin the stroke with your hands in normal paddling position. This stroke is best done with your torso. Remember to push on your right foot when doing a right side stroke. It is also recommended that you practice this stroke with your rudder &/or skeg out of the water (undeployed). Either one can actually inhibit a tight turn. Before starting your stroke, if your weight is centered in your kayak, you will have each foot on their respective foot pedal and you knees/thighs will not be in contact with the thigh braces. When ready, present the power face of the blade on the water in front of you, as close as you can get to the kayak by your foot. I like to present the blade almost flat on the water, so I can get support, since I am beginning to edge and lean. You can see my kayak's blue deck is under the water line. As I start sweeping my blade I keep a climbing angle on the blade so the blade will provide support and climb toward the surface. Think of this a a high brace sweeping forward stroke, with an angled blade instead of the blade flat on the water during the stroke. 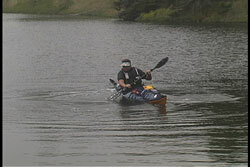 When I edge my kayak, I have the knee opposite the side being edged, in contact with the thigh braces. Another way of explaining it is lift my right left knee to edge my kayak to the right. Since we are doing this stroke to turn the kayak, there is an even better way to think of which knee to lift. When you want to turn to the left, you need to take the sweep stroke on your right side and drop your right edge. However, you can say "Lift your left knee to turn your kayak to the left" when doing a forward sweep stroke on your right side. Since everyone has preferred ways of remembering skills I thought I would share the different possible ways to remember which leg to lift. I will continue sweeping the blade toward my stern while maintaining that climbing blade angle. The blade moves toward the surface as long as I continue to sweep. If you look at the pictures, you can see my top deck is under the surface of the water and my balance point is actually over the water. If I did not have a climbing blade angle I would not get the support I need and I would capsize. The more I can edge my kayak the more turn I get. So it behooves me to lean out over the water. I am actually using a moving brace that provides turning power. The edging will continue as long as I feel support from the blade. If I use less angle on the blade (more knife edge) I get less support, but more turning power. If I want more support I can keep the blade more as a brace, but I will get less turning power. You will be adjusting the blade angle as needed throughout the stroke depending on your desired turn and the amount of support you need to remain upright. When I get to the end of my stroke I will move my body back over the balance point of my kayak and decrease the amount of edging. You can see some of my orange hull appearing as I decrease the edging. I find I get the most support from my stroke from the catch (when the blade enters the water) through the 90-100 degree range. After that point, my blade is getting closer to the boat, which means I have less leverage from my paddle. The farther the blade is from the boat the more leverage you get from the paddle. If I am using the stroke on both sides, I will begin edging toward the other side when I place my blade for a stroke on that other side. If I am doing successive sweep strokes on one side, I may maintain a slight edge during the stroke recovery. I just keep my opposite knee under the thigh brace during the blade recovery to hold a little edge. 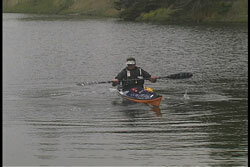 Even though I am edging slightly during the recovery phase, my body weight is still centered over my kayak by arching my body. A helpful hint, when doing successive strokes on one side, is keeping your blade face flat toward the water ready for a brace if you need it during the stroke recovery phase. Some folks prefer a low brace recovery (back face of the blade toward the water)and some prefer a high brace recovery (power face toward the water). Remember, This stroke is done with the power face in contact with the water. Let's look at the sequence again from a slightly different viewing angle. This perspective will show you how much I am leaning over my capsize point all because I have support from my blade. As I said earlier this is a full body stroke. You will feel the torso rotation if you do this stroke correctly. This stroke is an excellent stroke to demonstrate the feeling of torso rotation on your trunk muscles. Pressing on your foot pedals will give you more leverage for greater power for rotating your body. If you use just arms you put your shoulder at risk at the end of the stroke. Keep watching the blade and it will help get that extra torso rotation at the end of the stroke. As I do this stroke I challenge myself to see how far out I can sweep the blade. The larger the arc from the paddle the more leverage there is for turning power. Remember this stroke is an excellent method for turning while going forward. It can either bring you back on course or it can turn you if you want to alter your course. It is all done with forward momentum. 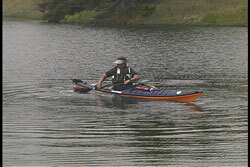 Novice kayakers often use a paddle rudder to steer their kayak. While a paddle rudder is effective, it also decreases one's forward momentum. Using the supportive forward sweep stroke keeps your momentum going while providing directional control. After all, why do you want to slow yourself down if you are trying to cover distance? That is why forward momentum turns are better for touring. If you wish to turn in place, you can use the supportive forward sweep stroke in combination with the information contained in USK's article, "Supportive Reverse Sweep Stroke." Just do a forward sweep on one side and a reverse sweep on the other. Continue using both strokes until you are pointing in your desired direction. The supportive forward sweep stroke can be used in other ways and with a number of combination strokes that will be discussed in other articles. It is a great stroke to use when conditions get rough and you want support while paddling forward. Instead of paddling with a high shaft angle lower your hands and do forward supportive sweep strokes on both sides and you will continue moving forward. The climbing angle of your blades will provide support during the stroke. I often use this stroke after I punch through a wave. I keep moving forward, yet I get support in the rough water of the surf zone. I will dig deeper once the water clears from my eyes and I feel balanced again. I suggest you begin your practice in calm water so you can play with your balance point. Once you feel confident that you can do this stroke on flat water, try it in confused water conditions. Once you perfect this stroke you will find it very comforting on those rough days.